I know what you are thinking, how could I run so freaking slow? Well, I was back in my home town, Madison, MI and I have a 12 year old nephew who is becoming a pretty good runner. 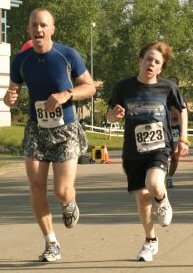 I decided to enter him into a 5K and run with him (at his pace) for his first competition. He did a darn fine job, placing first in his age group, which was age 1-19! His pace varied a little bit, but he never walked, and this was his very first race at this distance. The age group awards are engraved plaques (which will get mailed later) so that is cool. This race was slow. Had I run a ‘normal’ 5K pace for me, I would have finished in 4th or 5th place overall, way high for 449 runners. Granted it was a little on the hot side. In fact they shut down the marathon a little early because it go so hot. There were 4 races going on this day, a marathon (780 finishers) a half marathon (2038 runners) and also a 10K (511) in addition to our 5K. Maybe all the fast people were running the marathon, who knows. This was great prep for next week, though. My nephew and I were there for the start of the marathon, so I got into the whole feel of the beginning. It was very very emotional. I felt just like I did the 20 minutes before my my half marathon back in April, just very emtional, to the brink of crying. Wierd. Now there is nothing between me and Sunburst. I know I will feel that way again, and I just have to hold on. Once I start and get 800m down the course, I will be just fine. It was good though to feel that again, so I can prepare for it.